Edition 15 + 2 A/P. Durst Lambda Fuji Crystal Archival Photographic Print. Veronica Bailey presents 'swimming at midnight', a photograph that originates from a private family letter written by the Welsh actor Richard Burton (1925-1984) in July 1972. Only recently rediscovered, this correspondence (a photocopy of the now lost original) was sent to Bailey's aunt and uncle, after being signed by both Burton and his then wife, the Anglo-American actress Elizabeth Taylor (1932-2011). At a time when correspondence was unlike today's mobile texting and social networking applications such as Twitter and Facebook, this typed letter reveals a family man who was 'surrounded by women' with children who jovially invaded his privacy 'like the secret service'. Bailey draws focus on the author's apparent whimsical prose; revealing more text than in previous works, such as Postscript 2005. Burton's wit and humour are revealed playfully as the story unfolds. The title 'swimming at midnight' refers to a childhood event -a proposed sleepover attended by the Burton's daughter - at which the pool adventure might occur. The potential for such youthful excitement under the moon and stars of a summer night evokes envy in both Burton and his wife, whilst also inciting the viewer to share in this sense of possible pleasure too. Bailey's recalls such rare childhood experiences in the early seventies were available to only a few fortunate families who had swimming pools in their back gardens. Her cousins and their friends were amongst the lucky ones, living out the Hollywood lifestyle in the north London suburb of Hadley Wood. 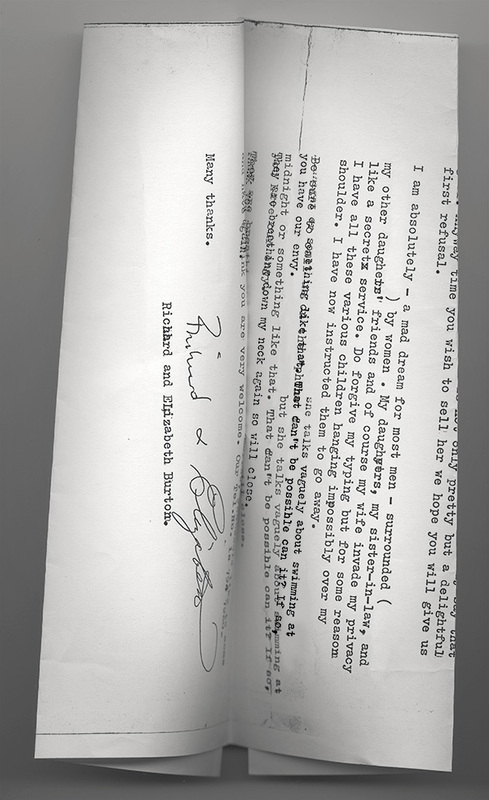 Burton's letter draws to a close with a sense of near physical contact 'they are breathing down my neck again'; he extends thanks with a welcome invitation for Bailey's aunt and uncle to share in a drink at the Burton's Hampstead residency the following day. Over forty years later, Bailey finds herself paraphrasing the author, as she recounts the sentiment "That can't be possible can it? If so, you have our envy."